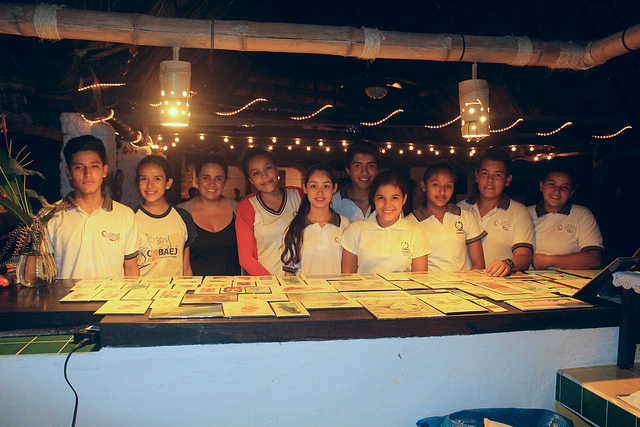 On Wednesday night we had the honor of hosting the art class from the Prepa school here at Casa de los Sueños. Nadia, the teacher, and her students came with beautiful pieces they had painted to show and sell to our group of Yogis. These are some really talented and inspired artists, you can see that they were so proud to show their work and excited when they sold something. Nadia is extremely motivated and hardworking, not to mention an absolute sweetheart. I have had the privilege to get to know some of the teachers from the school and they are all hard working, fun and motivated people. The teachers in this country are up against very difficult odds, coming from government regulations that are un-helpful and un-realistic, circumstances of teaching and living conditions, down to daily issues of all teachers that can be frustrating and demoralizing. We are so happy to help in any small way that we can and look forward to a continuing relationship of collaboration (we are talking murals, workshops, and much more here at Sueños). Some people ask me, "why are you interested in the Prepa? "...my reason is simple. I remember being high school aged, I had the luck of going to a school where the teachers made an impact on my life in the best ways, I was allowed to be myself, to be creative, to grow into an adult that feels confident and supported. I helped start a teen center when I was fresh out of high school, I did this because I knew I was lucky and not everyone had the same support I did in school and at home. I wanted to be there for youth that was lost and in need of someone just to talk to, to see them as a person. Being a teenager is, I think, the most difficult, delicate, and important passage in life. It is a time to learn who you are, who you wish to be, who your friends are, and what path you would like to take into adulthood. For that reason, I hope to support the people that are supporting these kids, these kids that, with any luck, will go out into the world to learn and grow and come back to their little town with inspiration and hope for the next generations. And most certainly that would be a much less likely possibility if we don't have a high school here in Yelapa. For that, I will continue to support as much as possible. Stay tuned for ways you can help to.